Lisbon has a very complete public transport network! Besides the Lisbon subway there are buses, trams and elevators that will fulfill all your needs. Download the bus, tram and elevator network map. This Lisbon map is organized by colours. Bus, tram and elevator lines have the same colour as the zone they serve. Nine buses that operate every night and two other buses working on Friday, Saturday and holiday’s eve nights. See the following link for more information about the daytime network and nigh bus network maps. 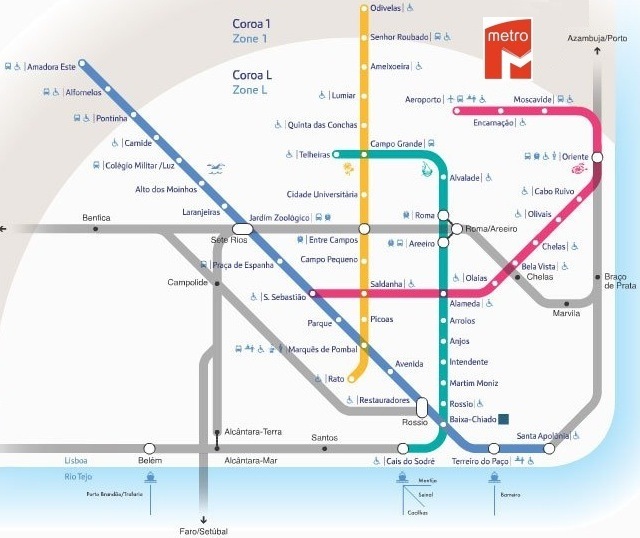 If you need more information about the Metro, check our previous post about Lisbon Subway Network Map. Don’t forget, if you intend to visit Lisbon, book an apartment in Lisbon Historic Center with TravelingToLisbon. Lisbon has a very complete public transport network: subway, bus, tram and boat. If you are visiting Lisbon Historic Center, the Lisbon Subway is a good and fast option to get there from the Lisbon Airport, Oriente Train Station or Santa Apolónia Train Station. Once you arrive to the Lisbon Historic Center, most of the touristic spots are walking distance reachable. But remember, there is a reason for Lisbon being known as the city of the seven hills. During your visit, a non-frequent ticket should be enough. You pay 0,50€ for the card (rechargeable!) and 1,40€ for a single ticket. The ticket is a combined Carris/Metro ticket (you can use it in the bus, tram or subway). After validation, you can use the subway, Carris Buses, or Carris Trams for 60 minutes). However, if you think you will use the metro more often you can purchase a 24h ticket for 6€ and use all the Subway/Carris network. A third option is the “Zapping”: you charge your card with a specific amount and use it according to your needs. You can charge the card with 5€, 10€ or 15€. Opens at 06h30 (the first train leaves from the terminal station of each line). Closes at 01h00 (this means that the last train leaves from the termination station of each line at this time).